Brad showing off curb cut. Ever since Brad Lancaster gave us a tour of his lush desert landscaping, I have been meaning to write a blog about leaving the leaves and bark where they fall. We have three big eucalyptus trees that are always dropping something…branches, leaves, or bark all over our back yard. 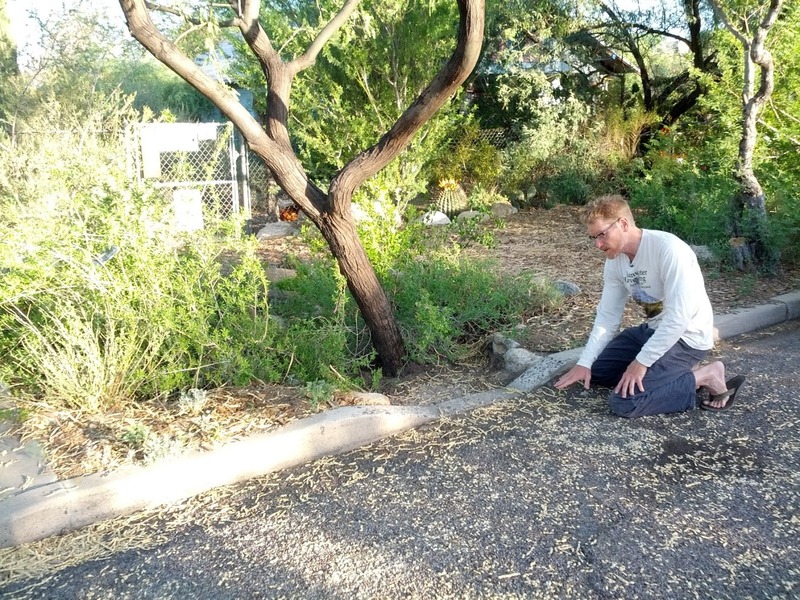 Let me tell ya, it was pretty friggen’ cool to learn about curb cuts from the man who initiated the first guerilla cuts in Tucson - back when they were still illegal! A curb cut is where you cut out a section of a street curb allowing water to flow from the street into a catchment basin. 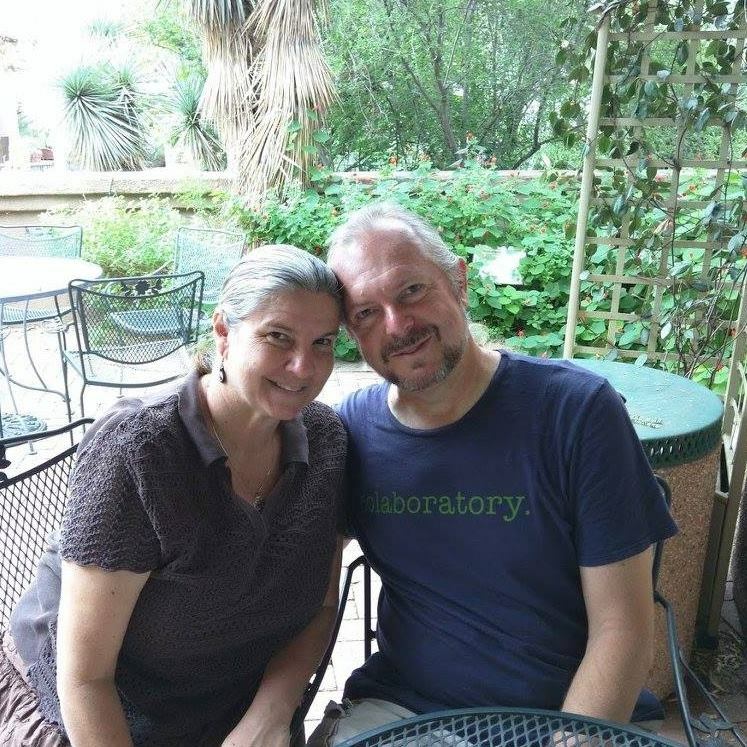 The water then sinks into the ground and irrigates a desert tree (usually mesquite or palo verde). 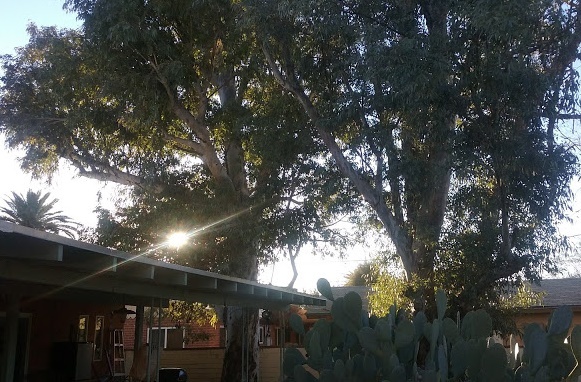 That is why the trees that line Brad’s street in the Dunbar/Spring neighborhood are so big and full - creating an oasis in the desert. A catchment basin with mulch, a bush and a mesquite tree. Brad explained how he made the catchment basin by digging a 2-3 foot hole, lining the hole with rocks with sections on different levels. 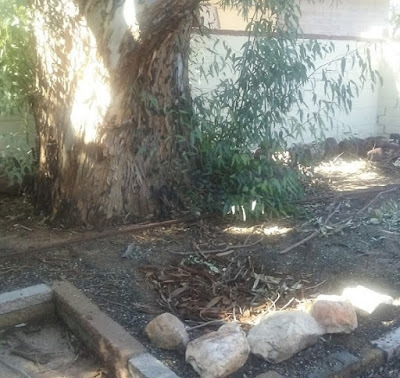 He filled the hole with wood chips, and planted desert grass, bushes and trees in the different sections depending how much water they required. 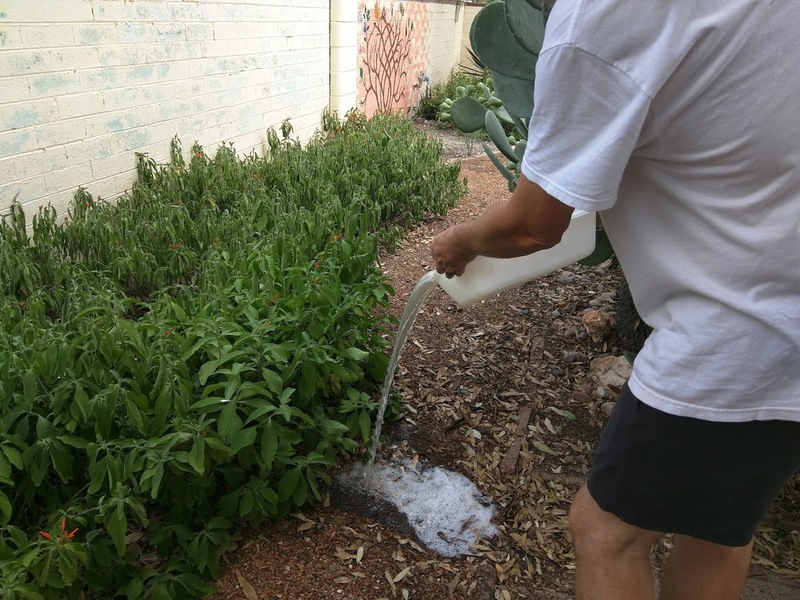 The wood chip mulch works together with the roots from the grass and bushes to create a sponge to hold the water, and allows it to sink into the ground, refilling our aquifer. This is what Brad calls "planting the rain." The roots from the grass also act as a filter to remove any gas or oil picked up from the street. How cool is that! Brad also shared how he used the chop and drop method to make natural mulch around his trees. He dug up some of the mulch to show how rich the soil was under it. 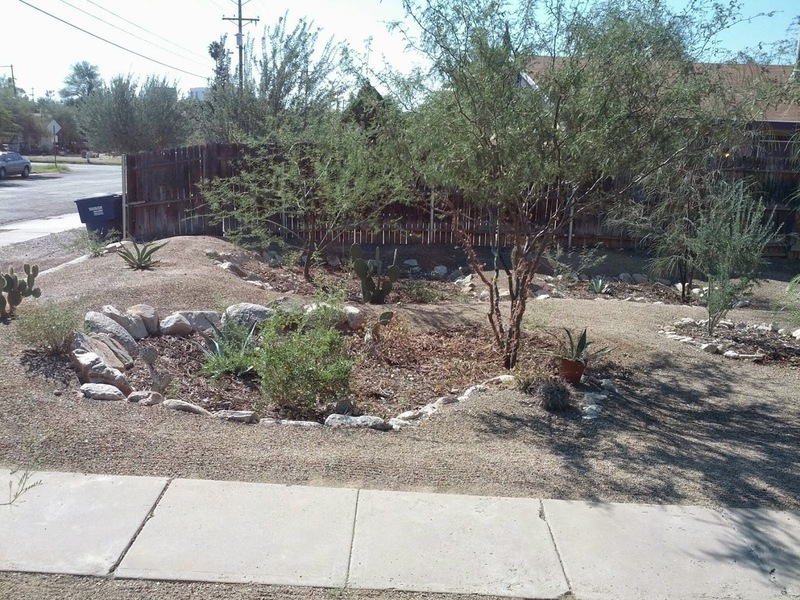 Unfortunately, in Tucson, our idea of a tidy, well-kept yard requires raking up all that good stuff and throwing it in the trash to become part of a landfill. Dan pours dish water in channel instead of directly on Hummingbird Trumpets. Dan and I have been experimenting with other ways to use these techniques. As some of you may recall, we have been incorporating some simple rainwater harvesting features in our backyard. I dug a little channel from our brick patio to the hummingbird trumpets. Then we started watering them with dirty dishwater. We didn’t want to put the soapy water (even environmentally friendly soap has sodium) right on the plant. So we poured it in my little channel. I noticed the impact of the water was causing erosion, so I lined the ravine with dried leaves from the eucalyptus trees to slow down the flow. (I googled to make sure the toxic leaves wouldn’t hurt the plant. Some people thought it might actually benefit the plant by keeping away bugs. But all toxicity fades when it dries up and starts to degrade.) We also alternate with clear water (the water left over from rinsing vegetables, etc. ), to ensure the soil doesn't get sodium buildup. Bark lets water sink in while rocks help block splashing. Then Dan began watering the eucalyptus trees with dish water. But when I threw the water on it, it splashed mud back at me. (Kinda like spitting in the wind…) So I decided to try a mini version of a catchment basin – so it wouldn’t splash me. 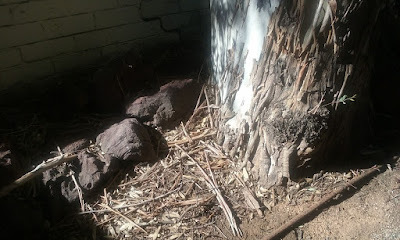 I dug a six inch hole and covered it with some old eucalyptus bark that I crumbled into smaller pieces with my hands. 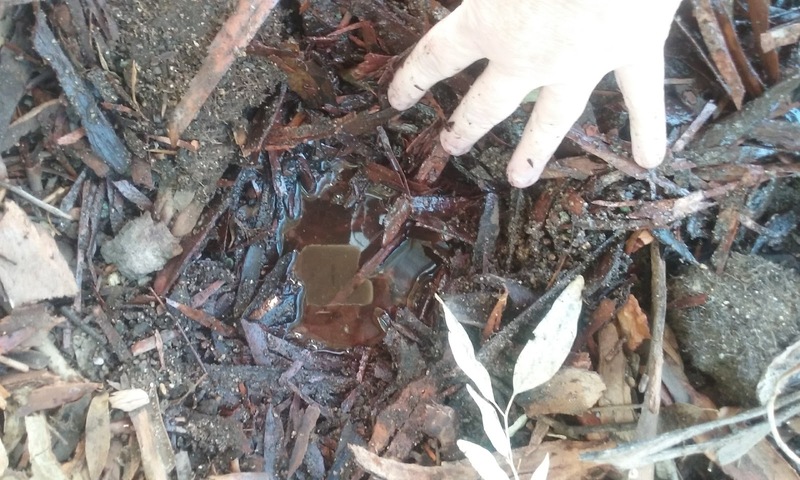 I dug a hole under the bark and voila... WATER! Yesterday, I was curious about how well the water was sinking in, so I dug up the bark and found water under the dirt. The bark was keeping it from evaporating. Of course, this is all a process (a learning one at that...) Someday we would like to get a chipper to turn all those sticks and bark into natural mulch to replace the boring gravel that keeps the rain from sinking into the ground. I think Brad would be proud. For more information on how to "plant the rain" read Rainwater Harvesting for Drylands and Beyond by Brad Lancaster or contact Watershed Management Group.